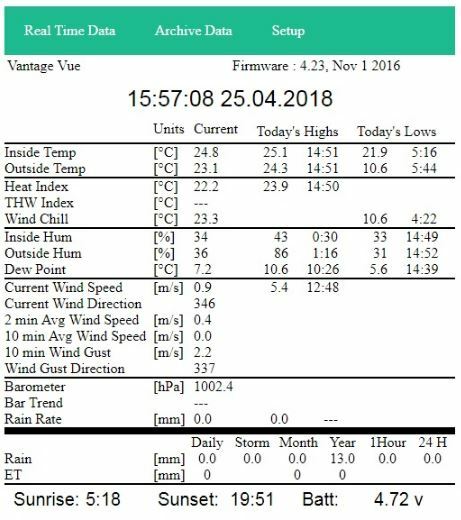 We’re delighted to announce the launch of a data logger for all Davis Vue and VP2/Envoy consoles that interfaces to PCs & other computers via your WiFi network and also uploads directly to Internet weather networks. Availability: A limited first batch of these WiFi loggers is now in stock – first come, first served! UK orders can be placed on our secure online shop. We can ship to Europe and worldwide (except N America) – please email us for a prompt Paypal quotation to include shipping. Quantity discounts (min 5 units) will be available in future – please enquire. 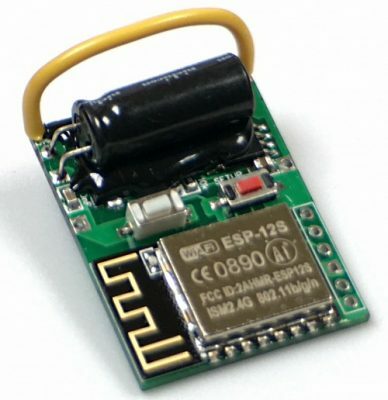 The WiFi logger (WFL) is small (40x25mm) and completely replaces the standard Davis logger. It is compatible with all Vue and VP2/Envoy consoles running firmware v1.9 or later**. The WFL logger fits into the console socket in a similar way to the standard logger and occupies much the same space – ie it is fully contained within the standard console case. Please note that the WFL connects only via WiFi – there is no provision for a cabled data connection. **If your console still has older firmware then updates are downloadable from the support section of the Davis website. A key benefit with the WFL is that the console no longer needs to be close to either computer or router – the only requirement is reasonable WiFi reception at the console location. Uploads to Internet weather networks WFL has the capability built-in to upload directly to weather networks such as Weather Underground, the UK Met Office WOW platform and several other networks. No other computer is required to use this feature, simply registration and username/password etc for the target network(s). Is the WiFi logger compatible with Mac and other Apple products? All of the WiFi logger set-up and viewing real-time data locally is via standard web pages. These should be fully operational on all common web browsers, including Safari, and this aspect of using the WiFi logger functions perfectly well whatever the device used to view the web pages, eg both Mac and Windows computers, iPads etc. Any uploads from the WiFi logger to weather networks such as Weather Underground happen direct from the logger. So these will of course continue to happen perfectly well whatever the device used to view the logger’s web page interface. Users who wish to pass data from the WiFi logger to other software running on a Mac computer should remember that the WFL emulates a Davis WeatherlinkIP logger. So Mac-compatible client software needs to be able to accept data across a network from an IP logger. This means that software such as Weathercat IS compatible, but other programs such as Weatherlink for Mac that can only accept data from Weatherlink USB loggers will not be compatible. How easy is the logger to set up and to use? The logger is easy to set up and use. As with most WiFi devices, there is an extra initial setup step where the logger must first be introduced to your secure WiFi network. But once this step is done, all subsequent logger management is via its web interface and is straightforward and intuitive. How is the logger powered? As with the Davis IP logger, the WiFi logger can take its power from the console. However, the extra power requirement of all IP and WiFi loggers means that the console should preferably be powered via AC mains; console batteries are only recommended for short-term backup use in case of a mains outage. Connecting the mains adapter to a small PC UPS may well be a better backup approach. The logger has a built-in WiFi antenna; WiFi sensitivity/range will therefore be similar to many other WiFi devices that have an integral antenna. Performance should therefore be fine anywhere that there is a reasonable WiFi signal, but locations with only weak WiFi are probably best avoided for long-term reliability. The signal strength (RSSI) of your local WiFi signal can be seen on the WiFi Setup page of the logger’s web interface and advice on the minimum recommended RSSI is given in the WFL manual. Remember that the RSSI numbers will be negative and the larger or more negative the number, the weaker the signal. So you need to aim for a smaller or less negative RSSI value. NB There is no option to connect an external WiFi antenna. Can the WiFi logger upload to Weatherlink.com? If you already have a USB or IP logger with an account set up and actively in use at weatherlink.com then the WiFi logger should be able to continue uploading to the same account and using the same DID as previously. The WiFi logger does not itself come with a suitable hardware DID for a default weatherlink.com account. There are other ways in which uploads to the Weatherlink.com platform may be possible, but all weatherlink.com uploads are likely to be at the discretion of Davis Instruments Inc and are not guaranteed. How does the WFL compare to the Meteobridge products? WFL offers features comparable to the basic features in the Meteobridge products but lacks the more powerful MB scripting features and so is able to do less itself in the way of advanced data processing. For applications other than simple uploads to weather networks such as Weather Underground, WFL will typically be used in conjunction with software running on another computer whereas MB offers more of a standalone solution. Pricing of the WFL is roughly comparable to the costs of setting up a basic Meteobridge unit, while being substantially less than the MB Pro Red unit. Users looking for basic data handling and uploads via WiFi may feel that WFL is the simpler or more cost-effective option, while power users may prefer the extra data-handling features in the MB units.